This is a savory version of sticky rice parcels. The fatty pork belly seeps into the mung bean and into the rice. The rice is sweet and fragrant, pork and mung bean are umami. You may get a bite from the black pepper. This dish can become addicting. And I crave it often. 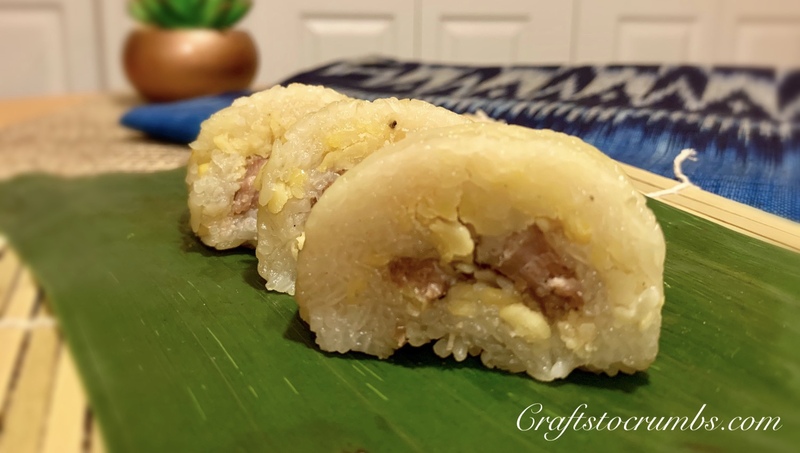 I don’t know the exact history of the dish, but I would almost bet that it was inspired by the Vietnamese dish, banh tet, which are made for the lunar new year. And with the hours of cook time, I can see why it’s served for such a special occasion. Luckily the recipe does make a ton and they freeze really well (up to six months). We can have it whenever the craving arises. But I digress, the reason why I would bet that it’s inspired by the Vietnamese dish is because khao tom moo is sometimes called khao tom gieo (khao tom Vietnamese). Duh! My sister makes these throughout the year and she can be pretty stingy with these. I like to think that something this good is mine, mine and mine. Maybe it’s the long cook time? You spend all that time on it, it’s yours. I haven’t worked up the nerves to ask her yet, so I guess we won’t know the answer. No matter what the answer is, it doesn’t matter. I can make it myself now! Thanks a lot. Cook time – adjust your cook time to the size of your parcels. If you parcel is about 1 1/2 inches thick, 3.5 hours or so should be good, but if your parcel is larger than 2 inches, it should cook for at least 4 hours. The larger the parcel, the longer the cook time. Some have been known to boil for 6 hours are more. You can use a measuring cup to measure rice and beans and get parcels that are more similar in sizes and they will cook evenly. I actually had to use two stock pots since mine were smaller. Water – make sure that the water in the pot is at least a couple inches above the top of the parcels. And keep a tea kettle with hot water to add to the pot. You don’t want to add cold water because it will halt the cooking process. Flip it – half way through the cook time, flip the top parcels to the other side, so it can cook evenly. Black and or white pepper – some prefer freshly ground black pepper and some prefer white. I like both. This is really up to your taste here. Rinse rice a couple of times and drain. Add peppers and MSG if using. Mix and set aside. Rinse split mung beans and drain. Season with black and white peppers and set aside. In a large bowl, mix sliced pork belly with shallots, black pepper, white pepper, salt and MSG. Set aside. Wash and dry the thawed banana leaves. Cut into 6 to 8-inch wide pieces and place on an aluminum foil sheet that is slightly larger. Scoop 3 to 4 tablespoons of rice onto banana leaf, followed by a couple of tablespoons of mung beans on top of the rice. Place a couple pieces of seasoned pork belly. Top with a little bit more mung bean and rice. Fold the banana leaf and aluminum foil together. Fold the long ends together to form parcels. Repeat until you have used all ingredients. Place two parcels together and tie tightly together with kitchen twine. Place bundles into stock pots and add water. Bring to boil and boil for 3.5 to 4 hours. Add boiling water to pot throughout. Hello! Welcome to my kitchen adventures.